If you’ve never planted a seed in the ground before, chances are the thought of growing your own vegetables — no matter how exciting — incites feelings of anxiety. But there’s help, and it comes in the form of a really easy-to-read, easy-to-understand infographic by Anglian Home. This guide was written for the United Kingdom, but the advice will work for other temperate regions of the Northern Hemisphere. Our gardening friends in the UK are known to be some of the best in the world! Some of the vegetable names are a bit different across the pond. Mange Tout are Sugar Snap and Snow Peas. Courgettes are Zucchini and Borlotti Beans are Cranberry Beans. 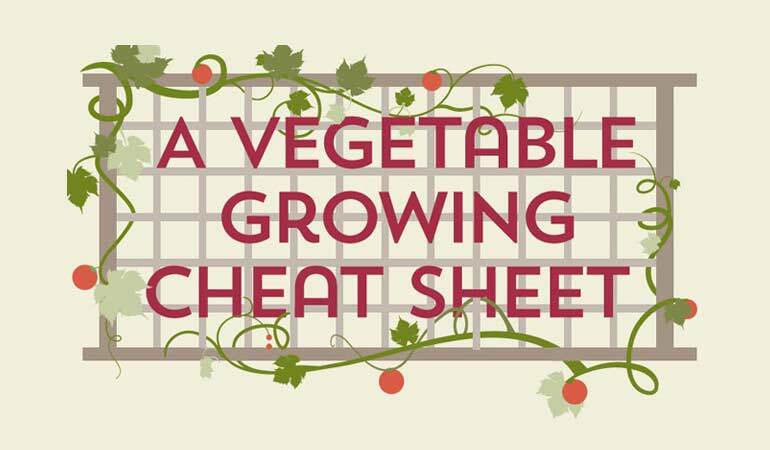 Click here to download the Vegetable Growing Cheat Sheet for print. To print the Cheat Sheet click on ‘File’ then click ‘Print’. It will print out full-size.